From left to right: Maureen Gile, Laurie Yahn, Kristine Dionne, Charisse Ricci, Sharon Mays, Kelley Haak, Crystal Lang, and Charlie O'Brien (our tennis pro at the time). In August of 2005, I found a lump in my breast. My mother was a Breast Cancer survivor, so I religiously performed my monthly self-exams. It was tiny, about the size of a pea, but I knew something wasn’t right. I had an ultrasound and the doctor saw it as suspicious. I was given the names of several good surgeons in the area. The one that could see me the soonest was Sarah Willard. She got me in quickly and was just a lovely person. She explained we needed to biopsy the lump, and ask when I wanted to do it. I said, "Tomorrow!" She called the hospital right away, and the next morning I had the lump removed. Little did I know that while I was in recovery after surgery, Dr. Willard told my husband that she thought it was malignant. I was by myself when I got the call that it was cancer. There is no easy way to get that diagnosis, but Dr. Willard did the best she could. When I hung up the phone, I called my husband, Paul, who was out of town with a brand new job and told him the scary news. He was a few hours away but told me he was “on the way home”. The rest is a bit of a blur. I called my friend, Crystal, who was on my Sanlando Storm, WAIT League tennis team to tell her that I got the call and it was cancer. She told me, "I will be right over." The next thing I know, the ladies from my team were arriving at my house with wine. We sat at my kitchen table and had a glass of wine and just talked about the diagnosis and everything else. My tennis team was such an important part of my support system going through the diagnosis and treatment and beyond. They organized meals every time I had chemotherapy, which was such a huge help. My children were 16 and 12 years old when I got the diagnosis. It was very hard on them. Anything to keep it “normal” for them was so important. My tennis team bought me such thoughtful gifts. Kristine bought me some flannel pajamas so I would be comfortable. One of my dearest friends on the team, Crystal, actually sewed a ponytail full of hair into a Nike tennis hat so when I played tennis while going through chemotherapy, it looked like I still had my hair. I can’t tell you what that meant to me. Anything to feel normal going through the process of breast cancer treatment is huge. I had a number of surgeries before starting chemo. I had the initial biopsy and a double mastectomy with reconstruction. During the mastectomy, the doctor tested some lymph nodes to see if the cancer had spread. Unfortunately, it had spread to some of the closest lymph nodes so I had to have a lymphnodectomy to take more out. Luckily, the next lymph node check came back with good results. Nothing had spread further. My Oncologist said I shouldn’t play tennis anymore so I wouldn’t end up with Lymphodemia. I told him NO WAY! That was my outlet, my fun, and I wasn’t going to stop playing. My tennis team was a huge part of my recovery. Obviously, during all the surgeries I couldn’t play much. When I started chemotherapy the end of December 2005, it took its toll. But when I felt up to playing, my team welcomed me with open arms. I knew my game would be off (and it was) but they were always so sweet and they all said they would gladly play with me. After the chemotherapy there would be one more surgery to finish the reconstruction. Dr. Rotatori did a great job of returning me back to as normal as I could possibly be. The whole process from finding the lump to recovering from the surgery took close to a year. My team, friends and family were with me every step of the way. They laughed with me, cried with me, went to chemotherapy with me. I just completed my 7th year check up and everything is going well. After taking almost a year off, my tennis never got back to where it was before the cancer diagnosis, but that’s not important. My tennis team kept getting better and better and currently are playing in the “A ” division in the WAIT league. My whole family plays tennis and my daughter has continued her tennis into college, where she is on the tennis team at Florida Atlantic University. I love watching my children play tennis and watching the professionals play. I make a trip to Miami every year to go to the Sony Ericsson tennis tournament and watch the pros play. I still play for fun but have returned to work since then. Whenever I have time, I enjoy getting on the court and am thankful every day that I am healthy enough. I have never gotten Lymphodemia and consider myself blessed. However, what I am truly blessed with is the love and support from family, friends and my tennis team. In the end, tennis is not just a sport, it’s a family and a way of life. 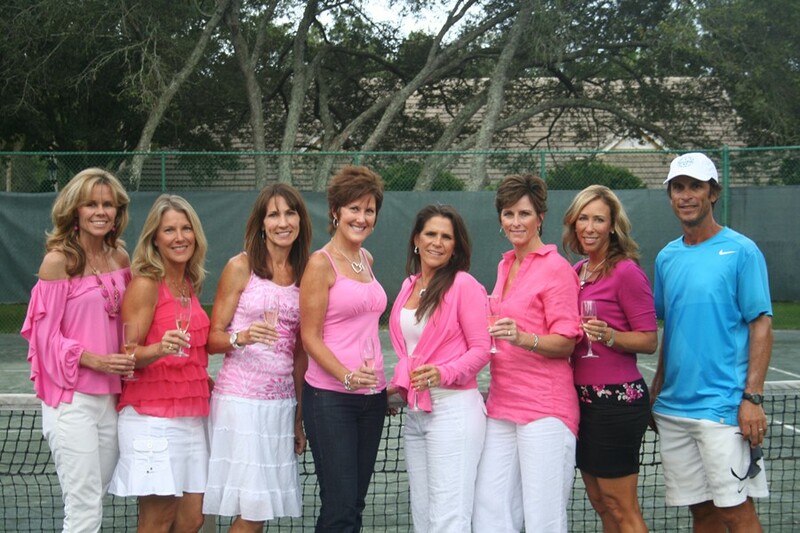 Visit our Pink page to find out how USTA Florida & Women Playing For T.I.M.E. have teamed up for the month of October in the battle against cancer and how you can help too.